As you begin to decorate this fall, don’t just rely on the sights and sounds of Halloween to cast a spooky spell. Indulge in Scentsy fragrance to combine the pumpkin, cinnamon and cider scents of the season to scream Halloween from your house — haunted or not. Scentsy’s New Releases and Fall & Winter fragrance collections are full of Halloween-inspired scents that pair perfectly with a Pick of the Patch or Spooky Warmer from our Harvest Collection. Drop in a few cubes of our new Porch Pumpkin or Autumn Hearth, or warm the familiar fragrance of Autumn Sunset, Cider Mill or Farmstand Pumpkin and revel in the coziness of the season. Feeling a bit more frightening? 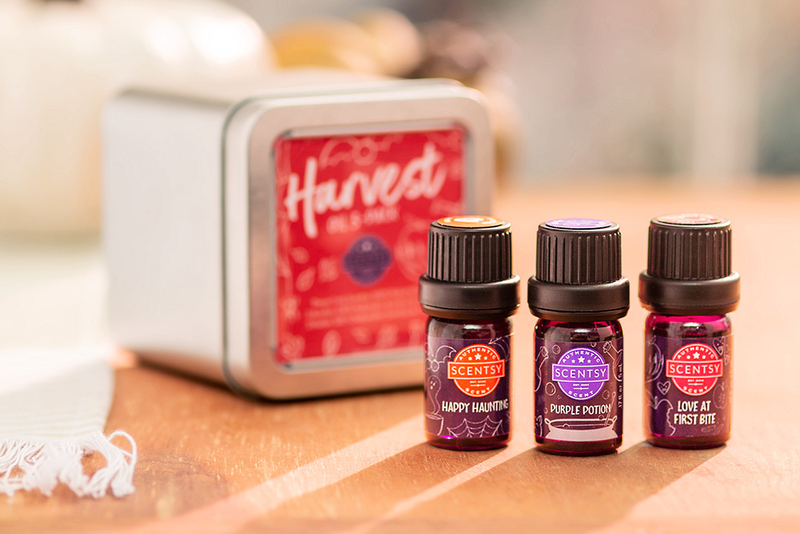 Our Harvest Oil 3-Pack includes three 100% Natural Oils in a decorative tin. With fragrances like Happy Haunting, Love at First Bite and Purple Potion — and the alluring ambiance of our new Prosper Scentsy Diffuser — ghosts and goblins won’t stand a chance. You don’t need a cauldron of hot apple cider to make your home smell like the real deal. 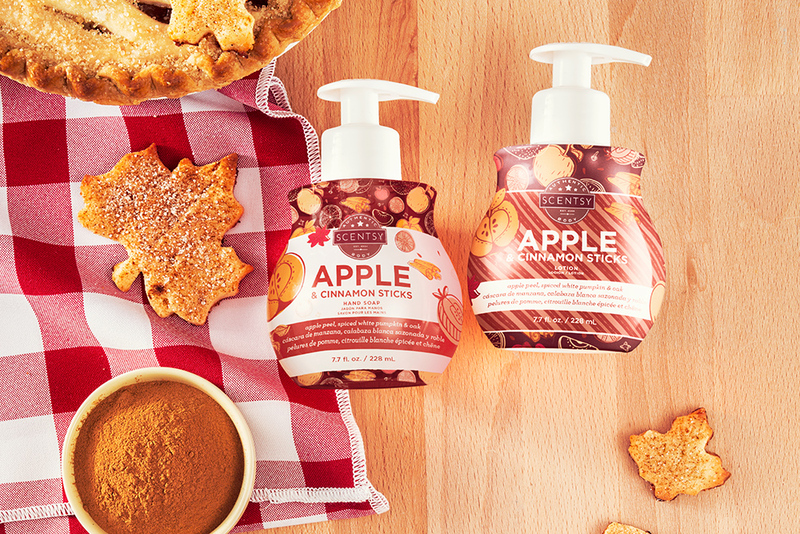 With Cedar Cider, Apple & Cinnamon Sticks or Honey Pear Cider Scentsy Bars in your Rustic Pumpkin Warmer, you’ll have everyone fooled. And you’ll lure plenty of trick-or-treaters with the sticky-sweet Candy Crave , Bubblegum Blast and Sugar fragrances warming in your Dearly Departed Mini Warmer poised enticingly near the front door. 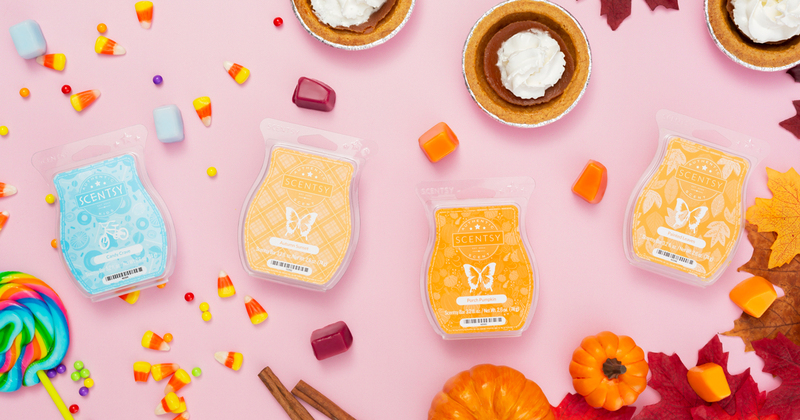 You can even host a Halloween-themed Scentsy party and stock up on all your favorite fall fragrances — including freebies with a qualifying party order. Contact your Scentsy Consultant to shop the Fall/Winter 2018 Catalog and schedule your get-together today. If you don’t have a Consultant, find one near you at scentsy.com. Separator image Posted in Home Décor, ScentTrend. Pumpkin spice up your fall treats!